We’re always so quick to get rid of old things. So quick, in fact, that we often abuse or destroy the very things we should treasure the most. From fashions to principles, we so easily push aside the old in search of something greater, or more beautiful, or more popular. Some people have tossed out the Bible because it’s old. Of course I couldn’t do that. So I just tossed out the old of the old. That “out-with-the-old, in-with-the-new” mentality really had me. Until I read the New. And started noticing quotation marks. I couldn’t believe it. The New Testament was quoting the Old Testament. This was a problem. If I was going to say I believe the New Testament and read the New Testament and love the New Testament, I might have to believe, and read, and love the Old Testament, too. And so I opened my mind and affections to a new stage of the journey. This new stage might be described in two simple steps. In with the old. Okay, so I might as well admit it. The Old Testament is just as important and just as amazing as the New Testament. It is the Word of God. So there’s that. What’s more, the Old Testament points to and prepares us for the glories of the New. I might as well learn to love it, because I really can’t do without it. Hard to understand and weird at times? Yes. But, hey, that’s where the fun begins. Because of the new. Personally, my primary reason for wanting to know and understand the Old Testament is because the New Testament uses it. Jesus speaks of it, and I want to know what Jesus says and how he thinks. 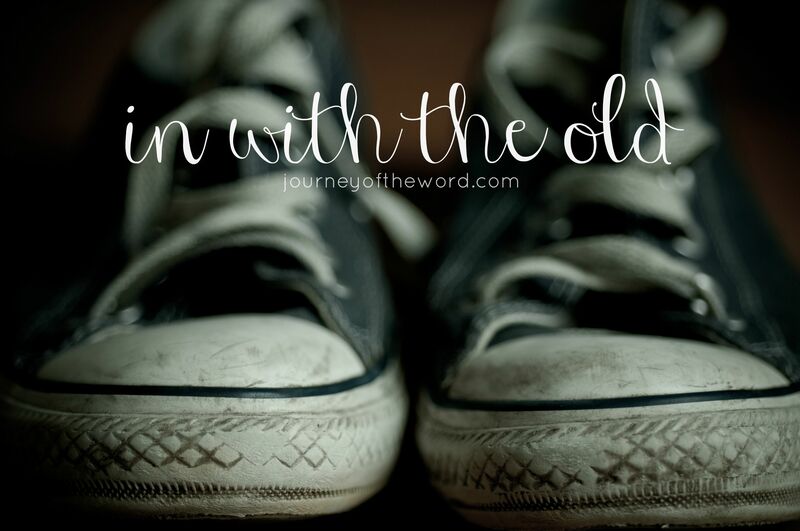 I need and love the New, so I must need and love the Old. One of my new goals is to see the Old Testament with New Testament eyes. All those quotations of the Old? Put them to good use, and ask, 1) Who originally said this, when, where, and why?, 2) Does the New Testament author say something interesting, revealing, or seemingly different about this Old Testament passage?, and 3) How might these examples map out an appropriate and biblical method by which we learn to live the Old Testament as God would have us “New Testament Christians” live it? The Old Testament is in our 21st-century hands for a reason. And it’s not just so we can read three chapters a day for every one of the New. Not so we can tell our kids some amazing Bible stories. And not so we have plenty of material to choose from, take it or leave it. God is in those pages. In every strange name and place we can’t pronounce. In every ark measurement and song of lament. In every tale that takes us to another life in another land in another age. In every law that makes us glad we’re free. If we knew we could find our God even there, in the most ancient of texts, I am convinced, our time, in his Word and otherwise, would look much different. Almost new. The Old Testament is wonderful. I’ve heard it said that the Old Testament was God’s picture book while the New Testament was God’s workbook (hence the quotations). The New Testament shows that the God of the Old Testament is the same and hasn’t changed. People and times have changed, but God has not. We can know He hasn’t changed because we can still look at the Old Testament and see! So many feel the way you do about the OT. My husband has been preaching a series on Christ in the Kings. It’s been fascinating. The OT points to Christ in so many places, and yet, we miss it.